Général Léodomir MUGARAGU yaba yitabye Imana! Amakuru atugeraho avuye muri bamwe mu bakurikirana ibibera muri Congo, yemeza ko Général Léodomir Mugaragu wari umwe mu bayobozi bakomeye b’ingabo z’umutwe wa FDLR (Forces Démocratiques de Libération du Rwanda) yishwe mu ijoro ryo kuri uyu wa gatatu tariki 11 Mutarama 2012 mu gace ka Walikare muri Kivu y’amajyaruguru muri Congo. Général Léodomir Mugaragu yari umwe mu bayobozi bakomeye b’umutwe wa FDRL. Yahoze mu ngabo z’u Rwanda za kera, akaba yari muri promotion ya 15 y’ingabo z’u Rwanda yasohotse mu ishuri rikuru rya gisirikare (ESM) mu 1977. Nyuma y’isohoka ry’umwanzuro w’inzobere ku kibazo kijyanye n’iraswa ry’indege ya Perezida Habyalimana, ndetse n’amagambo yavuzwe na Maître Bernard Maingain wunganira abasirikari 7 bahoze ari aba FPR, aho avuga ko dossier umucamanza Jean-Louis Burguière yahereyeho asohora impapuro zirega abo aburanira zakurwaho ngo urubanza rugahagarara kuko iyo dossier nta gisigayemo, kuvuga ngo indege yarasiwe i Masaka ni urwenya ngo bimaze kwemezwa ko indege yarasiwe i Kanombe. Akomeza avuga ko abatanga buhamya Lieutenant Abdul Ruzibiza ndetse na mugenzi we Sergent Emmanuel Ruzigana a.k.a sederi ubarizwa mu gihugu cya Noruveji, ngo bisubiyeho bagahakana ibyo bari batangiye ubuhamya mbere, uwitwa Richard Mugenzi we ngo avuga ko yategetswe gutanga ubutumwa butari bwo n’abari bamukuriye. Avuga na none ko ngo na Innocent Noble Marara na Musoni nabo mu buhamya batanze bavuze ko bari abasirikare ba APR nyuma bakaza gutangaza ko batigeze baba abasirikare. Mu kiganiro Noble Marara yagiranye n’umunyamakuru wa BBC Gahuza-Miryango Ally Yusufu Mugenzi, Noble Marara avuga ko atigeze yivuguruza ngo ibyo yabwiye umucamanza Jean-Louis Burguière mbere niko bikimeze ntacyo yabihinduyeho. Aho Maître Bernard Maingain wunganira abasirikari 7 bahoze ari aba FPR, avuga ko Marara yavuze ko atari umusirikare wa APR, Noble Marara yashimangiye ko yari umusirikare ko ibyo uwo mugabo avuga atazi aho ayo magambo ayakura, ndetse avuga ko abasirikare bavugwa ko bagize uruhare mu ihanurwa ry’iyo ndege nka General Kabarebe bamuzi neza ko yari umusirikare, ndetse atanga inimero ye yari afite mu gisirikare cya APR avuga kandi ko yari anafite ipeti rya Sergent. Noble Marara yakomeje avuga ko ibi biri gukorwa ubu ari urubanza rwataye agaciro kubera inyungu z’u Rwanda n’u Bufaransa! Abajijwe niba ataravuze ko indege yarasiwe i Masaka mu buhamya bwe, Noble Marara yanze kugira icyo abivugaho, avuga ko ibyo yabwiye umucamanza Jean-Louis Burguière mu buhamya bwe igihe cyo kubikoresha nikigera bizakoreshwa ariko ko ibiri gukorwa ubu ari ibintu bya corruption gusa, ngo ntabwo yasubira mubyo yabwiye umucamanza Jean-Louis Burguière ngo abiganireho ubungubu. On Tuesday, January 10, 2012, the experts that were appointed by the judges Trevidic and Poux revealed their findings with regard to the investigation into the culprit of the terrorist attack of 6 April 1994 that particularly took away the lives of President Juvenal Habyarimana of Rwanda and his counterpart President Cyprien Ntaryamira of Burundi. In front of an audience of thirty people including the plaintiffs, the defense counsel of the suspects (RPF members close to President Paul Kagame) and the prosecutors, the experts shared their findings at the High Court of Paris before an attentive audience. For nearly 4 hours, from 2pm to 6pm, the judge Trevidic, along with Nathalie Poux, the second judge in this case, introduced the report of over 300 pages. But the main content was presented by the experts who were present for the occasion. One after another, expert surveyor, expert in explosives, expert in arms, expert in aviation and expert in acoustics, who joined the investigation team, gave to the audience their conclusions based on their respective fields of expertise. The first certainty is that through a process of elimination, the experts confirmed that the aircraft was shot down by a portable missile SA-16 (SAM 16) made in former Soviet-Union. The second certainty is that there have been two shots including a missile that missed the plane and another missile that hit the plane. The third certainty is that the reactors of the aircraft were not affected by the missiles and remained intact. The fourth certainty is that the left wing of the aircraft was hit. Indeed, analysis of the wreckage shows that the missile hit the tank in the left wing. With these elements, the mission of the experts’ team was to determine the location from where the missiles were fired, a crucial part of this investigation into the attack that plunged Rwanda into the horror. None of the experts could determine alone the launching site which was determined by cross-checking all expertise and analyzing testimonies, twelve in total. In total, six possible launching sites have been identified by the experts through a process of elimination in order to identify the most likely location. The ideal position for an experienced shooter was, according to experts, the site of Masaka (either the farm or the valley). But the experts judged that such a site was to be dismissed due to two factors identified as critical. 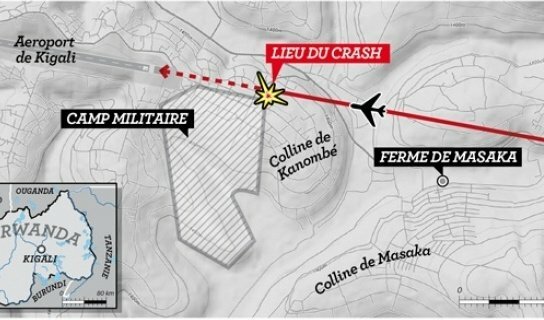 The first factor is the story of three prominent witnesses, a French soldier and two Belgian military doctors who were present that day at Kanombe military barrack and said that they heard the blast of missiles. The acoustics expert said that it was impossible to hear the blowing of missiles from Masaka, located more than 3 kilometers away. He believes that, given the distance, the plane would have already hit the ground before anyone can hear the blowing of the missiles. The second factor is the impact of the missile and the occurrence that the missile hit the left wing of the aircraft. According to experts, the missiles usually follow the heat of their target. But when the plane was shot down, it had already passed the Masaka hill, which means that if the missile had come from behind (i.e. from Masaka) it would have reached the reactor instead of the left wing of the device. The experts’ conclusion on this point is therefore that the missile came forward before reaching the left wing of the aircraft. However, the aviation expert orally argued that she cannot be categorical on this last point, because as the experts agreed, the first missile missed its target. It is therefore possible that the pilots changed the trajectory of the aircraft. Another hypothesis that was put forward by the experts but was immediately ruled out is that of the barnyard that was located in the courtyard of the assassinated President. This hypothesis has been quickly rejected because the experts estimate that if the missile had been launched from there, it would have reached the right side of the aircraft, not the left one. Another insight from the experts is that the missiles SAM-16 utilized to shoot down the aircraft were used by specialists because their use requires an extensive training of at least 50 to 60 hours. The experts also stressed that there were two shooters. At the end of the presentation, Judge Marc Trevidic, who read the conclusions of the experts alternately with judge Nathalie Poux, said that all parties had three months to provide comments on the report of the experts; they may also request a counter expertise. After collecting all the comments, the judges Trevidic and Poux will analyze the experts’ report in the light of other facts of the case, especially the many testimonies. Pending the outcome of the investigation of the judges, nobody is exonerated and nobody is charged; this is by the way not the role of the experts. It is up to the judges Trevidic and Poux, at the end of the investigation, to publish a full report about the possible involvement of RPF members suspected of being behind the terrorist attack or eventually charge other suspects. « Uwarashe Indege ya Habyarimana arazwi ». Général de Brigade BEM Emmanuel Habyalimana. Muri raporo yabo yaraye isohotse igahita isakara ku isi uko itari, Abafaransa bazobereye mu bumenyi bw’indege no kuzihanura bemeje ahantu hatandatu hashoboka abantu barashe indege ya Perezida Habyarimana nabo yari itwaye bashoboraga kwihisha. a) Ahantu 6 basuzumye bagasanga abarashe indege bashobora kuba ariho bari bihishe. Batangaje ko abarashe iyo ndege bashobora kuba baritwikiriye ijoro bakihisha ahantu 6 harimo n’ikigo cy’abasikare cy’i Kanombe. Ariko ntibigeze bavanamo n’agasozi ka Masaka. Iyo anketi rero igaragaza gusa ahantu hashoboka abarashe indege bashobora kuba barahisemo. Uumuntu wese uzi neza akarere ka Gasabo abona ko hari ahantu henshi hashoboka. Bityo uwateguye kurasa indege igiye kugwa ku kibuga cy’i Kanombe akaba yarahahisemo akurikije misile yari afite yo kuyirasisha. Abasirikari ba FPR babaga ku kimihurura muri CND bashobora kuhahitamo no kuhagera ubwabo cyangwa babifashijwemo n’ibyitso byabo kuva hasi kugera kuri Marcel GATSINZI waje guhita aba umukuru wa Etat-major w’ingabo zatsinzwe nyuma yiraswa ry’indege yaritwaye Perezida Habyarimana, na Roméo DALLAIRE wari uhagarariye MINUAR bizwi neza ko yafashaga FPR. Bityo tukabona ikibazo atari ahantu henshi abarashe indege bashobora kwihisha. Ikibazo nyamukuru ni kumenya uwayirashe n’icyo yayirashijije. Njye ndabona impaka bavuga ko zirangiye ariho zijya gutangira. Ese abemeye iyo raporo ko itabogamye biteguye kwemera n’imyanzuro y’Umujuji naramuka yemeje ko aribo barashe indege bakayirasira ahantu hamwe muri aho hatandatu havugwa muri iyo raporo bemera? Tubitege amaso. Aho ntibizaba nka bimwe tumenyereye m’urukiko mpanabyaha rw’Arusha rurekura abere, abicanyi n’abahunga ubutabera bakavuza induru! b) Umujuji TREVIDIC wakoze anketi ntacyo aravuga, agahita avugirwa imyanzuro. Ninde akeka ko yahanuye indege ya Habyarimana? Ari k’uruhande rw’ingabo zatsinzwe cyangwa izatsinze za FPR? Ni iyihe ntwaro akeka kandi afitiye gihamya ko yakoreshejwe mw’ihanura ry’iyo ndege y’umukuru w’igihugu Habyarimana n’abo yari itwaye bose? Haba mu ngabo zatsinwe cyangwa zatsinze, abasikare bahawe imyitozo yo kurashisha misile yarashe iyo ndege ni abahe? Misile yarashishijwe indege yagurishijwe kandi igurwa n’ikihe gihugu? Ni ibihe bimenyetso bifatika umujuji afite cyangwa abantu yabajije kumpande zombi zari zimaze gusinyana amasezerano y’amahoro intambara irangiye kugira ngo anketi ye itamera nk’imwe ya Mutsinzi yibanze kungabo zatsinzwe, ikarengera ingabo zatsinze? Biratangaje kumva Minisitiri Mushikiwabo Louise avuga ko impaka zirangiye kandi tutaramenya neza ibimenyetso umujuji yakusanyije agamije gusubiza ibi babazo. Nawe se yaba ategeka umujuji w’umufaransa imyanzuro nk’uko Perezida P.Kagame abikora iyo afungishije abo adashaka? Tuzi ko Bitugukwaha ibaho kandi ngo umwera uturutse ibukuru bucya wakwiriye hose. Ariko se twemezwe nanone ko Perezida N.Sarkozy akoresha uko yishakiye ubutabera bw’ubufaransa nk’uko Perezida P.Kagame abigenza mu Rwanda? Niyo kandi byaba uko abyifuza, inkuru yabaye kimomo. Ntakundi byagenda usibye kwemera ko P.KAGAME ari we watanze amabwiriza yo kurasa indege ya Habyarimana kandi akabikora mu gihe cy’amahoro intambara yararangiye dore ko nayo bakunze kuyitwaza. c) FPR n’ibinyamakuru birakwirakwiza ibyifuzo cyangwa propaganda yatangiye. Birigaragaza ko FPR yifuza ko umujuji w’umufarasa nawe ashobora kugera k’umwanzuro umwe n’uwa Mutsinzi nta bimenyetso bifatika agaragaje kumpande zombi zishinjwa. Kuriyo, ibinyoma cyangwa kwibeshya kubyabaye igihe cyahise birashoboka kandi byabayeho. Byayiha agahenge rero uwo umujuji nawe yemeje k’umukuru w’igihugu agira abanzi mubyegera bye kandi ko bishoboka ntabimenyetso bifatika ko Perezida Habyarimana nawe yari afite abanzi mu byegera bye bakaba bashobora kuba aribo bamuhitanye. Nyamara ibi byose n’ikomatanyirizahamwe ibintu. Uwo mujuji aramutse abyemeje ntaho byaba bitaniye n’ibyo baregaga umujuji yasimbuye Bruguière. Gukomatanyarizahamwe ni kimwe muntwaro uwabuze ibimenyetso simusiga yitwaza kugira ngo asobanure ibidasobanuka. Nibyo, ntabwo nagaragaje ibimenyetso byuzuye ariko kuba nabuze ibyo bimenyetso ntibivuga ko ibyo mvuga ataribyo, ari ibihimbano, ibinyoma gusagusa kubera y’uko hari ibintu bisa nibyo mvuga byigeze kubaho igihe cyahise. Gushoboka birahagije ko ibyo mvuga ari ukuri kutavuguruzwa. Kugira ngo FPR ibone uko yemeza ko habayeho umugambi wo gukora jenoside ntacyo ititwaza ngo yemeze amahanga ko Habyarimana yarashwe n’ibyegera bye. Ikimenyimenyi dore noneho n’abahanga b’abafaransa bemeje ko ikigo cy’abasirikare cy’i Kanombe kiri mu hantu 6 havuzwe muri raporo. Ibyo birahagije kugira ngo wemeze ko abarashe indege cyangwa abari bafite uwo mugambi wo kuyirasa bari mu basirikari be gusa? Ntakundi byagenda kuko FPR itari muri icyo kigo? Mu gifaransa ibitekerezo n’imyanzuro y’ubusamo nkibi babyita « Procès d’intention ». Icyo FPR yibagirwa kandi kizayikoraho mu minsi mike ni kimwe. Ni uko FPR igamije guhisha ukuri kuko ingaruka z’uko kuri kwagiye ahagaragara zizwi neza. Kwemeza ibyo idatangira ibimenyetso simusiga yerekana impamvu yatumye Habyarimana araswa n’abe, uwacuze uwo mugambi n’aho wacuriwe n’abo bafatanyije icyaha ntakindi biyimarira usibye guhisha ukuri kandi kwaraginje kumenyekana. Niba bakunda u Rwanda, abantu bo muri FPR bakiri bazima bakwiriye kwitandukanya n’agatsiko ka P.Kagame bagafasha abiyemeje kubwira amahanga ukuri kubyo twese tuzi kuri iri hanurwa ry’indege. Niba bitabaye bizabarushya kongera kwizerwa mubihe bizaza haba mu Rwanda cyangwa hanze yarwo. FPR ntacyo idakora kugeza igurishije igihugu ikamara abenegihugu kugira ngo amahanga yemere ntabimenyetso simusiga ko Perezida Habyarimana yagambaniwe kandi yarashwe n’ibyegera bye byari byarateguye jenoside y’abatutsi. Ese iyo adapfa Abatutsi n’Abahutu bishwe bari kwicwa? Ryari ? kuki ? gute ? Ni iki ? Ntisubiza ibi bibazo ahubwo irabikwepa ikihisha inyuma y’icyaha kiterabwoba tumenyereye ngo « révisionnisme, négationnisme » iyo bitabaye icyaha cy’ingengabitekerezo ya jenoside. Aho kugira ngo batange ibimenyetso byabuze mu rukiko mpanabyaha rw’Arusha by’uwateguye jenoside y’abatutsi n’abo bafatanyije icyaha, FPR idashaka ukuri ihitamo kuvuga gusa ngo ntabindi bimenyetso usibye abantu benshi bishwe twese tureba. Kuriyo, turebe imbere twiyibagiza amateka akomeye nkaya. Twemere tutabonye ibimenyetso simusiga byerekana ko Perezida Habyarimana yarashwe n’abateguye jenoside y’abatutsi igihe cyose hataraboneka umuntu uhakana yitwaje ibimenyetso bivuguruza ko ntabanzi yagiraga kandi bashoboraga kumurasa no gutegura jenoside y’abatutsi ! Twemere ihame « ritagatifu » ko FPR « ntagatifu » nta ruhare yabigizemo. Ntacyo yashakaga k’urupfu rwa Habyarimana kuko bari basinyanye amahoro. Ntayindi mpamvu yo kurwana yari ifite usibye kuza guhagarika jenoside y’abatutsi yatangiye itariki ya 1 ukwakira 1990 ikarangira tariki ya 31 ukuboza 1994. Nicyo bita mu gifaransa « hypothèse infalsifiable ». Hanyuma se jenoside y’abatutsi yakozwe amezi atanu kuva FPR ifashe ubutegetsi yo yakozwe nande ? Biroroshye cyane gukora aya macenga ! Ariko se kugeza ryari ko ntamahoro ateze kuba muri ruriya Rwanda ukuri kutabamo n’imana bavuga ko yirirwa ahandi igataha i Rwanda itazarugarukamo ukuri kutahatashye ngo twese tukumenye? 4.Kugeraka kubandi ibikorwa, imigambi n’ibetekezo byawe bigutera isoni (Projection). FPR ntacyo idakora ngo ibyo ibinyoma bitavugurujwe n’ibimenyetso simusiga bihinduke ukuri ndetse bibe ibimenyetso simusiga by’abadashaka ukuri kuri jenoside yakorewe abatutsi. Niyo mpamvu yihutira kwitirira abandi ibikorwa, ubugambanyi, imigambi n’ibitekerezo by’abahezanguni bayo bitwaza amakuba yabaye mu Rwanda, intambara, ngo basobanure ibidateze gusobanuka mu mateka y’u Rwanda n’isi nzima. Yabanje kubeshya ko yateye igamije guharika jenoside none byagaragaye ko itayihagaritse ahubwo yayihagarikiye ikarinda irangira uko yateguwe. None aho kwemera ukuri kwigaragaza ku manywa y’ihangu FPR yiyemeje kubuza abenegihugu kuvuga ibyo bazi cyangwa babona ngo batazavaho bakavuga ibitavugwa bahishura ibyahishwe imyaka 17 ishize yose babwirwa ibyo bavuga cyangwa batekereza. Ng’iyo intandaro y’icyaha cyo gukora jenoside mu bitekerezo « idéologie génocidaire » cyasizwe mu itegekompanabyaha ry’u Rwanda. Rero ngo bavuga ingengabitekerezo ya jenoside. Biratangaje kumva agatsiko k’abahezanguni na Perezida P.Kagame abari kw’isonga batakiregwa mubucamanza. Ni ukuvuga ko abandi batariwe n’agatsiko ke baba babarusha kuba abahezanguni maze bo bakishyira aheza muri bamwe bitaga « modérés » ? Abakunda u Rwanda mwese nimuhaguruke mwambarire urugamba. Ntakindi kizahuza abanyarwanda usibye ukuri babuze. Si mu mahanga tuzakura ukuri n’ubutabera tutabiharaniye ubwacu. Tugomba kubipfira cyangwa tukareka abanyamahanga bagakomeza kutugira uko bishikiye mu gihugu cyacu cyitwa ko cyigenga ku butaka no mu kirere byacyo. It has now become an established principle that leaders formerly cited as example by foreign lesson givers will die like an insect, and that no body will ask about their death. The former presidents of Rwanda and Zaire (now DRC) Juvenal Habyarimana and Mobutu Sesse Seko are good illustrative examples of African leaders who once enjoyed the West’s sympathies before losing them entirely and becoming unwanted. Habyarimana seized power after a coup d’ Etat in July 1973 and spent quite glorious years and managed to conquer the favours of French presidents – Valéry Giscard d’Estaing et François Mitterrand – as well as those of the former coloniser –Belgium – who had rather excellent relationships with the Republic of Rwanda, the one they helped install in 1961. This article will not cover those good old days of president Habyarimana, but rather those dark ones which he experienced during his last months as depicted by various authors who knew him or have interest in his death. We will mainly rely on the books by Jacques Roger Booh Booh (Le patron de Dallaire PARLE, 2005), general Romeo Dallaire (J’ai serré la main du diable, 2003), Filip Reyntjens (Rwanda : trois jours qui ont fait basculer l’histoire, 1995) and the writings and testimonies compiled in Silence sur un attentat, 2003, édited by Charles Onana, a journalist from Cameroon. In the beginning of 1994, President Habyarimana started being harassed and pressurised by the entire international community. Belgium, the Unites States, the UN, the World Bank, to mention a few, never accorded Habyarimana a minute to breath. Ce même soir du 22 février, Habyarimana avait convoqué une réunion dans ses bureaux avec tous les partis politiques, à l’exception du FPR. Dr. Kabia m’a rappelé tous les détails de cette rencontre. La communauté diplomatique et Boutros Boutros Ghali exerçaient beaucoup de pression sur le président afin qu’il résolve la crise politique. Il n’avait pas l’air de comprendre que, d’après l’accord de paix d’Arusha, le président avait renoncé à son autorité sur le gouvernement et que son nouveau rôle de Chef d’Etat était plutôt protocolaire. Sa seule arme était la persuasion. That very evening of 22 February , Habyarimana convened in his office a meeting of all political parties, excluding the RPF. Dr. Kabia gave me all the details of that meeting. The International Community and Boutros Boutros Ghali were exercising much pressure on the President so that he can solve the political crisis. He seemed not to understand that, after the signing of the Arusha Peace Accord, he had renounced his authority on the government and that his new role as Head of State was rather honorific. His single weapon was persuasion. In this respect, many people were wondering who was in control of the power. Who was controlling the government? Was it Mrs Agathe Uwilingiyimana with her interim government whose mandate had expired in December ? Who was responsible for finding the solution? Faustin Twagiramungu? Booh Booh? « Le président ne semble pas mesurer l’ampleur de nos problèmes et de notre réaction, nous nous en irons s’il n’y a aucune raison de rester »…Après une enquête sérieuse et sur la base des rapports de cinq sources différentes – dont le Ministre des Affaires Etrangères de la Belgique – le Secrétaire général peut affirmer que le président Habyarimana n’a pas tout fait pour réaliser la réconciliation nationale. La mise en place des institutions de la transition a deux mois de retard ! « Nous avons l’intention de retirer toutes nos troupes du Rwanda et de fermer le dossier » dit le Secrétaire général. « J’ai fait l’impossible pour vous aider et vous n’avez pas tout fait pour nous aider. Le retrait des troupes peut se faire dans quinze jours ou dans un mois. C’est ce qui s’est passé en Angola, en Afghanistan, au Liban, et bientôt en Somalie. Ces deux mois de retard coûtent plusieurs millions de dollars à l’ONU. Cette situation ne peut plus durer. Vous ne voulez pas la paix, vous avez une dialectique de confrontation de part et autre, l’Organisation a d’autres priorités dans le monde. Vous ne voulez pas nous aider, nous allons vous quitter ». Le Secrétaire général rappelle qu’il a téléphoné quatre fois au président Habyarimana « Vous avez continué à faire de la politique politicienne et c’est le peuple rwandais qui souffre. Nous allons nous retirer, cela se passera discrètement »… « Vous ne méritez pas l’aide qu’on vous a donnée. Vous ne nous avez rien donné en échange ». On top of the UN pressure came that of the World Bank, the most important financial partner of Rwanda. According to Dallaire (p. 232), that institution “ was threatening to stop its funds to Rwanda if the TBBG [Transitional Broad-Based Government ] was not in place by the 1st of March” . Dallaire notes that such a decision would have disastrous consequences as other countries and organizations would take the same move. It is in that state of mind that Habyarimana flew to Gbadolite to seek advice from his long-time friend and ally President Mobutu, with regards to his fears and sad times he was experiencing. Reyntjensperceives the two Habyarimana’s visits to Gbadolite in such short a period – 26 February and 4 April 1994 – as an attempt to seek sub-regional support as he could not expect any from the most influent members of the International Community (Reyntjens, p. 18). Habyarimana, who was previously powerful and an absolute strongman of Rwanda, finally found himself pushed into a dead corner by the International Community, which was giving him no other choice but giving up every thing to the internal and armed oppositions, thereby putting himself offside. This pressure was accompanied by another phenomenon, the one of having Habyarimana ignored, isolated and even insulted inside the country. We gave this background on purpose to allow an easier understanding of the comparison between “ Habyarimana the Glorious” and “ Habyarimana the Unhappy”. Encouraged by the idea that the International Community was fed up with Habyarimana who, they say, “was simply trying to stick to some vestiges of power to avoid prison or worse” (Dallaire, p. 268, translation: Olivier Nyirubugara), the internal opposition started humiliating him. On 22 February 1994, Prime Minister Agathe Uwilingiyimana, who was known for her abuse of language towards the President (Dallaire, p.255), abused the latter. D’entrée de jeu, le président Habyarimana a engagé une vive polémique avec sa Première Ministre Agathe Uwilingiyimana qu’il accusait d’avoir fait échouer les cérémonies de prestation de serment des députés et des ministres le 5 janvier. Il a prétendu que pendant qu’il recherchait une solution de compromis au sein du parti libéral et du MDR, la Première Ministre avait rendu publique une liste de députés controversée et unilatérale qui a failli provoquer des incidents graves au palais du CND. …Visiblement blessée dans son amour propre, madame la Première Ministre a interpellé sans management le chef de l’Etat, le traitant de fourbe qui chercherait à faire échouer l’accord de paix d’Arusha qu’il n’a pas hésité à appeler quelque part « chiffon de papier ». Quite at the start, President Habyarimana began a strong argument with his Prime Minister Agathe Uwilingiyimana, whom he accused of having caused the failure of the swearing-in ceremonies for MPs and ministers on 5 January. He pretended that whereas he was seeking a solution suitable for all within the Liberal Party and the MDR party, the Prime Minister preferred to make public a controversial and unilateral list which nearly provoked serious incidents at the National Assembly Palace. …Obviously hurt deep in her heart, Prime Minister Agathe Uwilingiyimana angrily called up the Head of the State, calling him a cheater, who was doing all to make the Arusha Accord fail as he did not hesitate to qualify that Accord of “trash”. The affront that Habyarimana suffered that day is ravaging. In fact, by accepting to be sworn in on 5 January 1994 within the framework of the Arusha Accord, Habyarimana had renounced many of his prerogatives and powers – namely the appointment and dismissal of the Prime Minister – and the function of President of the Republic had become “ honorific” (Booh Booh, p. 75). That explains why they could easily ignore and even insult him. Let us have a short stop at this insult to understand in which state of mind Habyarimana might have been. The Prime Minister is referring to the Rwandese culture, which actually has some philosophy of lie summarized by terms like Ubwenge – meaning not only “intelligence” but also “ smartness” – and Amayeri¬¬ - a term we also find in Lingala (Mayele) and which means “smartness” as well. These two terms do not exclude [slight] lies. This same culture formally forbids that a woman insult a man, in private or in public. The offence becomes worse when the man is older than the woman. A woman daring to violate that cultural law is called umushizi w’isoni, which means “ the one who violates cultural rules governing female reserve”. Knowing that Habyarimana was at least ten years older than his Prime Minister, we can guess how devastating the psychological chock was for him, who probably had to suffer similar affronts at every cabinet meeting. Whereas Habyarimana had lost his power and powerfulness, his former classmate at the Kabgayi Junior Seminary Joseph Kavaruganda, chairman of the Highest Court of Appeal (Cour de Cassation) and ipso facto chairman of the Constitutional Court, was becoming an indispensable figure in the installation of transitional institutions. The President took his oath in front of him, and without him or his approval, the institutions could not be put in place. The reasons for ending his friendship with Habyarimana remain unknown. Au 5 janvier 1994, la donne politique était la suivante : selon le schéma d’Arusha, le MRND s’est vu attribuer un poste de président de la République (honorifique), cinq postes de ministres et onze postes de députés, de même que le FPR avait cinq ministres et onze députés. Tous les autres partis politiques réunis possédaient les postes de président et de vice-président de l’Assemblée nationale, onze postes de ministres (y compris celui de premier ministre) et 37 postes de députés. By 5 January 1994, the political map was the following; according to the Arusha power sharing scheme, the MRND had the position of the President of the Republic (honorific), five ministerial portfolios and eleven seats at the National Assembly; likewise the RPF had five ministerial portfolios and eleven seats at the National Assembly. All other parties together had the position of Speaker and Deputy Speaker of the National Assembly, eleven ministerial portfolios (including the prime minister) and 37 seats at the National Assembly. Let us seize this occasion to regret the lack of information on the part of former aides of Habyarimana. Some of the details at their disposal could have allowed us to complete this work. There is no doubt that Habyarimana still enjoyed considerable support within the MRND, the army and among the population, especially in the north of Rwanda. It is with much appetite that we devoured the book by Edouard Karemera (Le drame rwandais :les aveux accablants des chefs de la Mission des Nations Unies pour l’Assistance au Rwanda ,Lille: Editions Source du Nil, 2006) seeking clews about the last days of president Habyarimana, at least among his own supporters. Unfortunately, that former minister and vice-president of the MRND party contented himself with taking note of and commenting the “heartbreaking consents of the heads of the UN Assistance Mission in Rwanda”, namely Booh Booh and Dallaire. Despite that, we salute his appeal to former political leaders under Habyarimana to take their pens and write to avoid one-way ideas and the distortion of the history of which they were witnesses (Karemera,p.21). From the foregoing, we conclude that any political man in the situation of Habyarimana as depicted above, would expect anything, since all the doors and ears would be closed to him. All that has been mentioned were just precursor signs that Habyarimana managed to detect as the coming shows. In any war situation, it is not surprising that a army commander, not to mention a supreme commander of the armed forces, fear for his life, as he is aware of the military principle that by decapitating the enemy, you vanquish him easily. Thus, Habyarimana was the first military target for the RPF and the first political target for the opposition parties allied to the RPF. Habyarimana was a “wanted” military and political leader who was aware of the growing pressure on his shoulders. He had certainly been informed by the French regarding the sol-air missiles that the RPF was hiding in the National Assembly building. Colonel Luc Marshall, UNAMIR deputy commander testified that late in February 1994 the French Embassy Defence Attaché, Colonel Cussac, came to him to ask if the UNAMIR was “sure that the RPF was not hiding Sol-Air missiles at the National Assembly building?” (Marchal, in Silence sur un attentat, pp. 29-30). The French having maintained their friendship with Habyarimana, or at least having shown no sign of hostility toward him, we can assume that they shared their intelligence about the missiles with Habyarimana, which certainly confirmed his fears. This is perhaps the source Honore Ngbanda is referring to when he writes about Habyarimana that he “ had ‘intelligence from credible sources’ that made no doubt at all in his mind as to the imminence of the danger awaiting him” ( Ngbanda, in Silence sur un attentat, pp.17-22). In April 1994, Ngbanda was Special Advisor to President Mobutu. He claims having attended the last meeting between the two presidents on 4 April 1994 in Gbadolite. According to his testimony (Ngbanda, idem supra), Habyarimana was “ exceeded”, “ scandalized”, “ revolted” and “ furious” against the Belgians and the Americans whom he considered to be the mastermind of the “ imminent project of his assassination”. He was asking Mobutu’s help because, based on the documents he had, he “ was convinced that certain western powers had decided to eliminated him physically”. During that « tense » and « exceptionally long, very long » meeting, Habyarimana acknowledged that what was pressure a few weeks before had become “ more and more pressing and unambiguous threats” and that Belgium and the United States were using hard word while talking to him (Ngbanda, idem supra). According to Lieutenant Abdul Ruzibiza, a former RPF intelligence officer claiming to have been member of the ‘ Network Commando’ assigned to assassinate Habyarimana, Habyarimana’s fears nearly transformed themselves into reality on his way back from Gbadolite on 5 January 1994. Ruzibiza writes that on that day, “ he was nearly shot down while flying back from Zaire but it was not possible to install the missile in the shooting position during the day” ( Ruzibiza, p. 237). 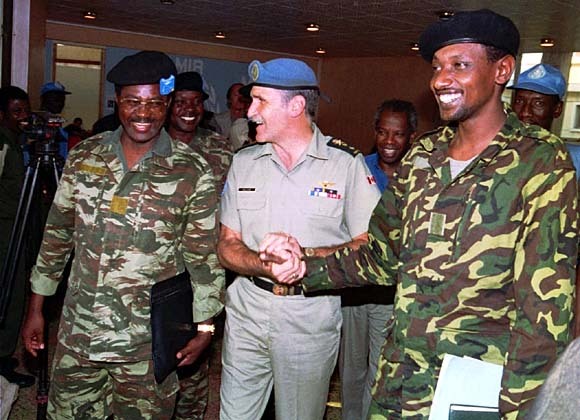 The two major generals – Habyarimana and Kagame – as depicted by two foreign observers – Ngbanda and Dallaire – who had had a chance to see them in a different mood, have many things in common: both of them appear in a different mood than usual; they are tense; they give a bizarre impression; and above all, they announce something horrible: “ imminent assassination” for Habyarimana ( Ngbanda, idem supra) and an imminent “cataclysm” that no body would be able to control for Kagame (Dallaire , idem supra). Two days after his meeting with Kagame, that is the day of Habyarimana’s last visit to Gbadolite, Dallaire and Colonel Theoneste Bagosora (Director of Cabinet of the Ministry of Defense) were attending a party offered by the UNAMIR Senegalese contingent to celebrate their country’s independence. On that occasion, Dallaire went to Bagosora “ who was drunk and who was more talkative than usual” (Dallaire, p. 285) and asked him “ if President Habyarimana had designated his successor” (Dallaire, p. 285). Dallaire adds that it was just a matter of curiosity “ to know the successor, in case something would happen to Habyarimana” (Dallaire, p. 285). He acknowledges at the same time that that question was like “ a bomb exploding in the ears of Bagosora ” (Dallaire, p. 285) who answered that he had no idea about Habyarimana’s successor. To the two above-mentioned major-generals in an unusual mood and tense, we should add a third general with an unusual and suspicious curiosity. Conclusion: plot or mere accident? One of the motors of the jet of former President Habyarimana. Whereas it is clear that Habyarimana saw his death coming and that he could not have avoided it, confusion persists about the plot theory. Writing about the so-called Dar es-Salaam peace summit on 6 April 1994, American journalist Wayne Madsen reveals that there have been numerous last-minute cancellations among the invitees, among whom Mobutu and Kenyan President Arap Moi (Madsen, in Silence sur un attentat, pp.64-65). He also notes that the Chief of Staff of the Burundian army Colonel Jean Bikomagu, a Tutsi, who was scheduled to accompany his President, was warned while getting ready to board the plane to Dar es-Salaam. Booh Booh himself, whose key mission was to favour any effort aimed to bring peace “declined the invitation which announced no agenda” and which appeared “hurriedly prepared and improvised” (Booh Booh, p. 143), and preferred to maintain his business-as-usual agenda consisting in preparing his 7 April trip to the drought victims in Kibuye. Quoting a testimony of former French Cooperation Minister, Bernard Debre, Madsen suggests that Ugandan President Yoweri Museveni played a decisive role in the plot. In fact, Burundian President Cyprien Ntaryamira came to Kigali because President Museveni “had persuaded the two presidents to fly to Kampala the day after to further work on the peace process”. After Ntaryamira had sent his plane to Bujumbura, “ Museveni retained Ntaryamira for a meeting” forcing the two presidents to fly later than planned, thereby making the task much easier for those who had ambushed them at the Kigali Airport. (Madsen, in Silence sur un attentat, pp.65-66). Whatever happened, the only thing that is almost absolutely certain is that Habyarimana underwent a serious psychological suffering when he found himself powerless in front of those who were insulting him, and when he saw death coming without having any means to escape. He certainly died with a tightened heart, in sadness! - BBC, BBC’s Stephen Sackur talks to Rwanda’s president, Paul Kagame, 7 December 2006. Posté dans 13 janvier, 2012 dans Non classé. 2 commentaires. Il est désormais devenu chose courante de voir un président jadis cité par les donneurs de leçons comme modèle mourir comme une mouche, sans que personne ne se soucie de lui. Les anciens présidents rwandais Juvénal Habyarimana et zaïrois Mobutu Sesse Seko sont deux exemples de leaders africains, qui ont eu toutes les faveurs de l’occident avant de les perdre entièrement et de devenir des parias. Habyarimana, qui a pris le pouvoir à la faveur d’un coup d’Etat en juillet 1973, a connu des jours les meilleurs et a su conquérir la sympathie des présidents français de l’époque – Valéry Giscard d’Estaing et surtout François Mitterrand – ainsi que celle de l’ancienne puissance coloniale qui avait des relations plutôt cordiales avec la République qu’elle avait aidé à instaurer en 1961. Cet article ne couvrira pas ces beaux vieux jours du président Habyarimana, mais s’occupera plutôt de ses malheureux derniers moments tels que présentés par différents auteurs qui l’ont connu et fréquenté pendant les derniers mois de son régime, ainsi que ceux qui se sont intéressés à sa mort. Nous nous baserons principalement sur les ouvrages de Jacques Roger Booh Booh (Le patron de Dallaire PARLE, 2005), celui du général Roméo Dallaire (J’ai serré la main du diable, 2003), de Filip Reyntjens (Rwanda : trois jours qui ont fait basculer l’histoire, 1995) et les écrits et témoignages compilés dans Silence sur un attentat, 2003, édité par le journaliste camerounais Charles Onana. Dès le début de 1994, le président Habyarimana a été assailli de tous les côtés par des pressions venant de la communauté internationale dans presque toute sa totalité. La Belgique, les Etats-Unis, l’ONU, la Banque Mondiale, pour ne citer que ceux-là, n’ont pas permis à Habyarimana de respirer. Ce même soir du 22 février , Habyarimana avait convoqué une réunion dans ses bureaux avec tous les partis politiques, à l’exception du FPR. Dr. Kabia m’a rappelé tous les détails de cette rencontre. La communauté diplomatique et Boutros Boutros Ghali exerçaient beaucoup de pression sur le président afin qu’il résolve la crise politique. Il n’avait pas l’air de comprendre que, d’après l’accord de paix d’Arusha, le président avait renoncé à son autorité sur le gouvernement et que son nouveau rôle de Chef d’Etat était plutôt protocolaire. Sa seule arme était la persuasion. A ce point-ci, beaucoup de gens se demandaient qui étaient en possession du pouvoir. Qui était le responsable du gouvernement ? Etait-ce Madame Agathe avec son gouvernement intérimaire, dont le mandat était expiré depuis la fin du mois de décembre  ? A qui revenait la responsabilité de trouver une solution ? A Faustin Twagiramungu ? Booh Booh ? « Le président ne semble pas mesurer l’ampleur de nos problèmes et de notre réaction, nous nous en irons s’il n’y a aucune raison de rester »…Après une enquête sérieuse et sur la base des rapports de cinq sources différentes – dont le Ministre des Affaires Etrangères de la Belgique – le Secrétaire général peut affirmer que le président Habyarimana n’a pas tout fait pour réaliser la réconciliation nationale. La mise en place des institutions de la transition a deux mois de retard ! « Nous avons l’intention de retirer toutes nos troupes du Rwanda et de fermer le dossier » dit le Secrétaire général. « J’ai fait l’impossible pour vous aider et vous n’avez pas tout fait pour nous aider. Le retrait des troupes peut se faire dans quinze jours ou dans un mois. C’est ce qui s’est passé en Angola, en Afghanistan, au Liban, et bientôt en Somalie. Ces deux mois de retard coûtent plusieurs millions de dollars à l’ONU. Cette situation ne peut plus durer. Vous ne voulez pas la paix, vous avez une dialectique de confrontation de part et autre, l’Organisation a d’autres priorités dans le monde. Vous ne voulez pas nous aider, nous allons vous quitter ». du Rwanda, si le GTBE [Gouvernement de Transition à Base Elargie] n’était pas en place le 1er mars ». Dallaire note qu’une telle décision aurait des conséquences fâcheuses car elle inciterait d’autres pays et organisations à faire de même. La pression internationale exercée sur le président Habyarimana augmente considérablement. Les ministres belges des Affaires étrangères et de la Défense, W. Claes et L. Delcroix, visitent le Rwanda, respectivement en février et mars . M. Claes prononcera, à l’adresse du Chef de l’Etat, une petite phrase qui sera fort mal perçue : « Il est minuit moins cinq ». Le président s’est insurgé de voir la Communauté internationale faire des pressions intolérables sur lui alors qu’elle restait muette sur les agissements criminels du FPR et de Museveni. Le président rwandais était scandalisé, excédé, et révolté par ce qu’il considérait comme « une injustice des Belges et des Américains ». Cet homme d’habitude flegmatique avait complètement perdu son calme. « Ils me demandent chaque jour de lâcher plus en faveur de Kagame alors qu’ils ne lui exigent absolument rien en retour ! » , lançait-il d’une voix cassée qui dissimulait mal sa colère. Habyarimana, jadis puissant et maître absolu du Rwanda, s’est donc retrouvé coincé par la communauté internationale qui ne lui donnait aucun autre choix que de tout céder à l’opposition intérieure et celle armée, se mettant ainsi lui-même hors-jeu. Ces pressions étaient également accompagnées par une autre situation, celle d’un Habyarimana ignoré, isolé et insulté à l’intérieur même du pays. Nous avons voulu tout d’ abord donner cet arrière-plan pour permettre une meilleure compréhension de la comparaison entre « Habyarimana le glorieux » et « Habyarimana le malheureux ». Renforcée par l’idée que la Communauté internationale ne voulait plus de Habyarimana, qui, selon elle, « essayait tout simplement de se raccrocher à quelques vestiges de pouvoir afin d’éviter la prison ou pire » (Dallaire, p. 268), l’opposition intérieure a voulu humilier Habyarimana sur tous les plans. Le 22 février 1994, la Première Ministre Agathe Uwilingiyimana devait faire appel à son traditionnel abus de langage contre Habyarimana, pour reprendre les termes de Dallaire ( p.255). …Visiblement blessée dans son amour propre, madame la Première Ministre a interpellé sans management le chef de l’Etat, le traitant de fourbe qui cherchait à faire échouer l’accord de paix d’Arusha qu’il n’a pas hésité à appeler quelque part « chiffon de papier ». Prenant le représentant spécial et l’ambassadeur de Tanzanie à témoins, madame la Première Ministre, très indignée, a déclarée que « les Rwandais sont des menteurs et que cela fait partie de leur culture. Dès le jeune âge on leur apprend à ne pas dire la vérité surtout si cela peut leur nuire », et a conclu que « le premier menteur du pays c’est Habyarimana », qu’elle a pointé du doigt. L’affront que Habyarimana a dû subir ce jour là est sans appel. En fait, en acceptant de prêter serment le 5 janvier 1994 dans le cadre des Accords d’ Arusha, Habyarimana avait renoncé à plusieurs de ses prérogatives et attributions –dont la nomination et la démission du premier ministre – et le poste de Président de la République était devenu un poste « honorifique » (Booh Booh, p. 75). Cela explique pourquoi l’on pouvait facilement se passer de lui, voire l’insulter. Arrêtons-nous un instant sur cette insulte pour bien comprendre dans quel état Habyarimana devait se trouver à ce moment. La première ministre évoque la culture rwandaise, qui a effectivement une certaine philosophie de mensonge que les termesubwenge -qui signifie aussi bien « intelligence » que « malignité »- et amayeri – mot qu’ on retrouve également en Lingala (mayele) signifiant « malignité » – résument bien. Ces deux termes n’excluent pas toujours le mensonge [léger]. Cette même culture interdit formellement qu’une femme insulte un homme, en privé comme en public. L’offense devient plus grave quand cet homme est de loin plus âgé qu’elle. Une telle femme est, dans la culture rwandaise, appelée umushizi w’isoni, ce qui se traduit par « celle qui viole les règles de retenue ». Sachant que Habyarimana était au moins dix ans plus âgée que sa première ministre, l’on doit deviner quel a été le choc psychologique du côté du président, qui devait peut-être subir les mêmes affronts à chaque conseil des ministres. Alors que Habyarimana avait perdu son pouvoir et sa puissance, son ancien compagnon de classe au Petit Séminaire de Kabgayi, Joseph Kavarugana, président de la Cour de Cassation et ipso facto président de la Cour Constitutionnelle, était devenu une personnalité clé dans l’installation des institutions de transition. C’est devant lui que Habyarimana a prêté serment le 5 janvier 1994, et sans lui ou son accord, l’installation des institutions de la transition ne pouvait se faire. Les causes de la rupture entre lui et Habyarimana restent obscures. Chacun des deux grands partis cherchait à placer dans son giron les ministres et les députés de ces petits partis qui étaient devenus dès lors l’enjeu véritable du processus de paix. Qui allait, au vu de ce partage de pouvoir initial, contrôler l’Assemblée nationale de transition ? Fort de ce qui précède, nous pouvons conclure que tout homme politique dans la situation de Habyarimana telle que décrite plus haut, ne pouvait que s’attendre à tout, car presque toutes les oreilles et toutes les portes lui étaient fermées. Tout ce qui a été mentionné plus haut n’était que des signes précurseurs que Habyarimana a dû percevoir, comme la section suivante le montre. Dans n’ importe quelle situation de guerre, il n’est pas anormale qu’un chef militaire, pour ne pas parler d’un commandant suprême des armées, craigne pour sa vie, en vertu du principe qu’en décapitant l’ennemi on le vainc plus facilement. Donc Habyarimana était la première cible militaire du FPR et la première cible politique des partis d’opposition favorables à celui-ci. Habyarimana était un chef militaire et politique traqué qui sentait l’étau se resserrer de plus en plus autour de lui. Il avait certainement été informé par les français au sujet d’éventuels missiles sol-air que cachait le FPR au palais du CND. Le colonel Luc Marshall, qui était le commandant en second de la MINUAR a dit dans son témoignage que l’attaché Défense près l’ambassadeur de France, le colonel Cussac est venu le voir fin février 1994, pour s’enquérir si la MINUAR avait « la certitude que le FPR ne camoufle pas des missiles sol-air au CND ? » (Marchal, in Silence sur un attentat, pp. 29-30). Les français étant restés du côté de Habyarimana, ou du moins n’ayant pas manifesté d’hostilité envers lui, nous pouvons supposer que celui-ci a été renseigné sur les missiles, ce qui a dû confirmer ces craintes. C’est peut-être de cette source que parle Honoré Ngbanda quand il rapporte les propos de Habyarimana qui « disposait de ‘renseignements obtenus de sources sures’ qui dans son esprit, ne faisaient plus l’ombre d’aucun doute sur l’imminence du danger qui le guettait » ( Ngbanda, in Silence sur un attentat, pp.17-22). En avril 1994, Ngbanda était conseiller spécial du Maréchal Mobutu. Il dit avoir assisté à la dernière entrevue entre les deux hommes le 4 avril 1994 à Gbadolite. Selon son témoignage (Ngbanda, idem supra), Habyarimana était « excédé », « scandalisé », « révolté » et « en colère » contre les belges et les américains qu’ils voyaient derrière « un imminent projet de son assassinat ». Il demandait l’aide de Mobutu car, documents à l’appui, il « était convaincu que certaines puissances occidentales avaient décidé de l’éliminer physiquement ». Dans cet entretien « tendu »et « exceptionnellement long, très long », Habyarimana a reconnu que ce qui était pression quelques semaines auparavant était devenu « menaces…de plus en plus pressantes et sans équivoque » et que la Belgique et les Etats-Unis ne mâchaient plus leurs mots quand ils lui parlaient ( Ngbanda, idem supra). …le 2 avril, j’ai rencontré le ministre de la Défense…Après l’avoir quitté, j’ai pris un hélicoptère pour rencontrer Kagame après le déjeuner. Il m’a paru distant et un peu renfermé…Son attitude était un peu surprenante, étant donné qu’il s’ingéniait à garder le secret sur les mouvements des troupes du FPR et leurs capacités de frappe…Finalement, je lui ai demandé s’il avait des questions à me poser…J’ai regardé son visage. Jamais, je ne l’avais vu aussi sombre. Il a seulement ajouté que nous étions à la veille d’un cataclysme et qu’une fois enclenché, aucun moyen ne permettrait de le contrôler. Les deux généraux majors – Habyarimana et Kagame- tels que décrits par deux observateurs étrangers -Ngdanda et Dallaire- qui ont eu à les voir sous un autre jour, ont plusieurs choses en commun: tous les deux apparaissent autrement que d’habitude ; ils sont tendus ; ils ont un air bizarre ; et surtout, ils annoncent quelque chose de terrible : « assassinat imminent » pour Habyarimana ( Ngbanda, idem supra) et « cataclysme » imminent que personne ne pourra contrôler pour Kagame (Dallaire , idem supra). Deux jours après sa rencontre avec Kagame, c’est-à-dire le jour de la dernière visite de Habyarimana à Gbadolité, Dallaire, comme le colonel Théoneste Bagosora, participait à la soirée offerte par le contingent sénégalais de la MINUAR à l’occasion de la fête nationale de leurs pays. A cette occasion, Dallaire s’est approché de Bagosora « qui avait bu et se montrait plus loquace que d’habitude » (Dallaire, p. 285) pour lui demander « si le président Habyarimana avait désigné quelqu’un pour son ‘dauphin’ » (Dallaire, idem supra). Dallaire ajoute que c’était une question de curiosité « de connaître le successeur, au cas où il arriverait quelque chose à Habyarimana » (Dallaire, idem supra). Il admet tout de même que cette question a dû « faire l’effet de bombe dans les oreilles de Bagosora », qui a répondu qu’il ignorait le dauphin de Habyarimana. Aux deux généraux à l’air changé et tendu s’ajoute un autre dont la curiosité inhabituelle suscite des suspicions. Conclusion : complot ou pur hasard ? L’un des réacteurs de l’avion de l’ancien président rwandais Juvénal Habyarimana. S’il est clair que Habyarimana a vu la mort s’approcher à grand pas et qu’apparemment il ne pouvait y échapper, le flou persiste toujours sur la théorie du complot. Parlant du sommet dit de paix de Dar-es-Salaam du 6 avril 1994, le journaliste américain Wayne Madsen révèle qu’il y a eu plusieurs annulations de dernières minutes, dont celles de Mobutu et du président Kenyan Arap Moi. (Madsen, in Silence sur un attentat, pp.64-65). Il signale également que le chef de l’état-major tutsi de l’armée du Burundi le colonel Jean Bikomagu, qui devait accompagner son président, a été averti alors qu’il s’apprêtait à monter dans l’avion à destination de Dar-es-Salaam. Booh Booh, dont la mission première était de favoriser tout effort de paix, a dû lui-même « décliner cette invitation sans ordre du jour annoncé » et qui lui paraissait « précipitée et improvisée » (Booh Booh, p. 143), et a préféré maintenir son agenda, qui consistait à préparer sa visite du 7 avril aux victimes de la sécheresse à Kibuye. Citant un témoignage de l’ancien ministre de la Coopération française, Bernard Debré, Madsen affirme que le président ougandais Yoweri Museveni a joué un rôle décisif dans l’attentat. En fait, le président burundais Cyprien Ntaryamira a fait le voyage de Kigali parce que Museveni « avait persuadé les deux présidents de se rendre à Kampala le lendemain pour faire avancer le processus de paix ». Une fois que Ntaryamira a renvoyé son avion à Bujumbura, « Museveni a retenu Ntaryamira pour des entretiens » forçant les deux présidents à s’envoler plus tard que prévu, ce qui faisait l’affaire de ceux qui leur avaient tendu le piège à l’aéroport de Kigali (Madsen, in Silence sur un attentat, pp.65-66). Quelque soit ce qui est arrivé, la seule certitude presque absolue que l’on peut avoir, est que Habyarimana a dû sérieusement souffrir psychologiquement en se voyant impuissant devant la situation, en se faisant insulter sans moyen de réagir, et en voyant la mort venir sans moyens d’y échapper. Il doit être mort le cœur serré, malheureux ! Iyi rapport ya Trévidic biragaragara ko izanye ibintu bibili by’ingenzi: kutubwira aho missile yarashe indege ya Habyalimana yaturutse , icya kabili kutubwira ubwoko bwa missile yarashe iyo ndege. Izi éléments zombi nizo mperaho nkora analyse yo kureba uwaba yararashe indege ya Habyalimana. Mu by’ukuri kumenya aho indege yarasiwe ntibiduha information nyinshi zituma tumenya uwaba yararashe indege. Ariko kumenya ubwoko bwa missile yarashe indege bishobora kudufasha kumenya uwarashe iyo ndege. Icyo iyi rapport ya Trévidic ihuriyeho n’iya Bruguière ni uko bose bahuriza ko iyo missile yarashe indege ya Habyalimana ari Missile SA16 yakorewe mu Burusiya. Ikibazo twakwibaza mu rwego rwo kumenya uwarashe indege ni kureba icyo gisasu cyarashe indege arinde wari ugitunze hagati ya ba FAR na ba FPR ? Ama rapport ya Minuar ndetse na za facture z’intwaro zerekana ko aba FAR iyo missile SA16 ntayo bagiraga . Naho ku gice cya FPR birazwi ko FPR yakoresheje izo misile bien avant mu ntambara ihanura helicoptère ebyiri za ba FAR. Ikindi icyo gisasu byagaragaye ko ari leta ya Uganda yakiguze bahereye mu ma facture yerekanwe baguriyeho intwaro. Museveni ntiyigeze ahakana koko ko iyo missile SA16 bari bayifite mu ntwaro zabo. Icyo yongeraho ni uko yavuze ko aba FPR bamwibye intwaro kandi ko batorotse igisirikari cya NRA bagatera u Rwanda. Ikindi MINUAR yari ifite intwaro nyinshi yazanye ije muri mission ya ONU kugeza uyu munsi nta muntu ndumva avuga ko intwaro bazanye zose zari zizwi ku buryo iyo missile SA16 nabo bataba bari bayifite. Ese buri contingent yazanaga intwaro ishaka cyangwa bari bafite intwaro bagomba kuzana n’izo batagomba kuzana ? Ni iki cyatwemeza ko iyo missile muri MINUAR nabo batari bayifite ? Umuntu yakwibaza impamvu President Clinton yohereje aba marines bagera kuri 300 i Bujumbura vers le 2 Avril 94 kandi nyuma indege iguye bahise basubira iwabo agana mu mu mataliki ya 10 Avril 94. Abo basilikari kuki ataribo baba barinjiye mu gihugu biyita MINUAR, binjijwe n’umukozi wabo Dallaire ? Uniforme se za MINUAR ntibyavuzwe ko hari n’iz’ababiligi zazimiye ? Nibande bari bazikeneye ? Abanyarwanda se ? non. Ese twamenya gute ko nta ba marines binjiye mu gihugu bafashijwe na MINUAR nuko bagakoresha iyo missile SA16 yari mu Rwanda ? Iyo missile kuyigeza i Kanombe aho bavuga ko barasiye indege ntibyari kunanira MINUAR kuko nta barrière nimwe yabahagarikaga cyangwa ngo ibasake. Uwo mucommando w’umunyamerika waba yarakoresheje iyo missile ya FPR niwe abaturage babonye yambaye imyenda ya MINUAR y’ababiligi nuko rumeur ko Habyalimana yishwe n’ababiligi igahera ho ? Abafaransa mbere na mbere barashaka ko uruhare rwabo mu gutoza interahamwe rutongera kuvugwa ndetse ko n’abasilikari babo badakomeza gushyirwa mu majwi n’ubutegetsi bwa Kigali. Ndetse bamwe mu bayobozi bakuru ntibahisha ko bibarakaza guhora batungwa agatoki, twavuga nka ba Alain Juppé n’abandi ba officiers bakuru. Ikindi Abafaransa ubu icyo bashaka ni ukugarukana influence muri Africa no gushaka aho biba umutungo kuko crise economique iri kubakomanga ku rugi aho mu Burayi. Ni muri urwo rwego Abafaransa bo icyo bakeneye ni ugushyira inyungu zabo imbere ya byose. Ntibifuza ko reputation yabo ikomeza kugaragurwa mu cyondo kandi bakaba banishakira aho bakura cash kubera ko ka crise kari kubageraho vuba vuba. Niyo mpamvu nabo bakeneye kujya muri Congo, Cote d’Ivoire, Lybie, etc kugirango igihugu cyabo gihumeke ho gato. Mu mishyikirano hagati ya Sarkozi na Kagame iherutse i Paris umwaka ushize president Kagame yavuze ko ibyabaye ari ukubyibagirwa ko ubu ari ukureba imbere. Ayo masezerano rero niyo tubona uyu munsi Kagame abwira Sarkozy ngo izo rapport muzikore ku buryo FPR idashyirwa mu majwi y’abarashe indege naho na France nayo yunguke mu bucuruzi kandi n’izina ryabo ntiryongere kugaragurwa mu cyondo baregwa kuba aba genocidaire bashyigikiye leta ya Habyalimana. Niba Kagame yarabemereye isoko ryo kwibamo rya Congo aho ama compagnie yabo nayo azaza kuvoma nabo bakamwizeza ko nta suite izaba kuri iyo rapport y’uwarashe indege, ubwo byagaragara ko ubucamanza bwanyonzwe ko ibyo tubona ubu ari ukumvikana muri politiki ntaho bihuriye n’ukuri ku byabaye. MINUAR ya Dallaire yagize uruhare rukomeye mu iraswa rya Habyalimana. Icya mbere nibo bacungaga intwaro zose mu mugi wa Kigali, icya kabili banyuraga kuri barrière zose badasatswe. Bivuze ko niba MINUAR iri muri coup yo kurasa indege kugeza umu commando (umunyamerika, umu FPR, etc..) aho arasira ndetse no kuhageza iyo missile SA16 byari byoroshye cyane kuribo. Niba iyo missile yarashoboye kwinjira muri Parlement ku Kimihurura iherekejwe na Minuar kuva ku Mulindi kugera muri Parlement, ntabwo MINUAR byari kuyinanira kwongera kuyigeza i Kanombe aho bavuga ko tir zaturutse. Agasozi ka Kanombe rero ni kanini si ngombwa ko urasa aba ari muri camp Kanombe. Kuba MINUAR yarahitaga ku ma barrière yose badasatswe byerekana ko bashoboraga gufasha umuntu warashe indege niba ahubwo atari umwe muri bo. Nk’ababiligi bashyizwe mu majwi ko baba bararashe iyo ndege. Kuvana missile muri Parlement bakayigeza i Kanombe byari byoroshye cyane kuko nta muntu n’umwe wabasakaga bahitaga ku ma barrière yose. Ikindi twibuka ni uko muri icyo gihe MINUAR ariyo yakoraga controle y’intwaro zose muri Kigali mu bice byombi kuba FAR no kuri FPR. Bivuze ko bari bazi circulation yose y’intwaro mu mugi kuko banagiraga imfunguzo za stock z’imbunda mu ma camp militaire kuko hose bahagiraga abantu babo bareba ko imbunda zitangwa. Iyi rapport ya Trévidic n’ubwo itavuga abarashe indege, ubu mumatelevision y’isi yose biravugwa ko Habyalimana yishwe n’abantu bo muri camps ye b’aba extremistes Hutu. Iyi thèse biragoye kuyemera kuko aba FAR nta missile SA16 bagiraga nk’uko nabivuze hejuru. Ariko rero aba FAR bashobora kuba batararabutswe ko hari abafaransa bashoboraga kurasa iriya ndege ya Habyalimana bagiranye ibanga na ba FAR bacye cyane. Abo bafaransa nta mu FAR n’umwe wabishishaga kandi bageraga ahantu hose kandi bagaca ku ma barrière badasatswe. Ubundi uyu mu jugeTrévidic agomba no kwerekana uruhare rw’Abafaransa nka ba Paul Baril kuko hari n’abavuga ko ariwe warashe Habyalimana. Ninde wamuhaye ikiraka ? Naho se Major Saint Quintin we wagiye gushaka boite noire mu ndege ikimara guhanurwa ? Iyi thèse nayo irashoboka kuko abafaransa nibo bagize accès kuri site indege yaguyeho ninabo batwaye boite noire itarigeze iboneka cyangwa barayisibye kubera des informations compromettantes. Abafaransa bo hari anabavuga ko bifuzaga kubura imirwano no kuburizamo amasezerano ya Arusha. Niba Habyalimana yarabatunguye agasinya baba aribo bamuhitanye ? Ese iyo missile ya SA16 yarashe bari bayifite abo ba Paul Baril ? Iyi missile niyo ishobora gutuma piste yabo ikurwamo. Duhereye kuri iyo missile SA16 yarashe indege ya Habyalimana, dusanga mu gice cya FPR iyo missile bari bayitunze. Iyo missile (bakuye mu Buganda nk’uko ama factures y’ubuguzi muri Uganda abyerekana) bigeze no kuyikoresha mbere bahanura za helicoptères za ba FAR. Kandi abasilikari ba FPR 600 bari muri Parlement ku Kimihurura bashoboye kuyivana ku Mulindi bayigeza ku Kimihurura bagiye mu za gahunda zo kuzana amazi n’inkwi! Kandi uko bajyagayo buri gihe bagombaga kuba baherekejwe na MINUAR. Niba rero iyo missile yarashoboye kuva ku Mulindi ikagera ku Kimihurura ni uko na MINUAR yabigizemo uruhare kuko yari ishinzwe gusaka imbunda ndetse no kubuza inyanyagizwa ry’imbunda muri Kigali muri cya gihe cy’amasezerano ya Arusha. Niba rero iyo missile SA16 barasanze ariyo yakoreshejwe mu kurasa indege birerekana ko FPR ishobora gutungwa agatoki kuko nibo bari batunze iyo missiles kandi aba FAR iyo missiles ntayo bari batunze. Ubu rapport ya Trévidic na Bruguière bemeza bombi ko missile yarashe iyo ndege ari SA16 yakorewe mu Burusiya. FPR rero yari iyifite yarayikuye i Buganda kuko abaganda bo ntibahakana ko bari bazitunze muri stock y’intwaro zabo. Iyi rapport ya Trévidic isa nkigira umwere Habyalimana kuko niba propagande zivuga ko yishwe n’Abahutu extremistes babonaga ajenjetse kandi ko yari yemeye amasezerano ya Arusha, byerekana ko ibyo tuvuga kuri Habyalimana ko ariwe wateguye genocide ataribyo. Niba yaragombaga kubanza kwicwa kugirango genocide itangire ahubwo icyo gihe twavuga ko Habyalimana ari le premier victime du genocide. Ubwo niba Kigali ikomeza kwemeza ko Habyalimana yishwe na ba extremiste hutu kugirango genocide tutsi itangire bivuze ko Habyalimana abaye héros national kandi ko agomba gushyingurwa mu irimbi ry’intwari zarwanyije genocide. Il faut être cohérent. 1. 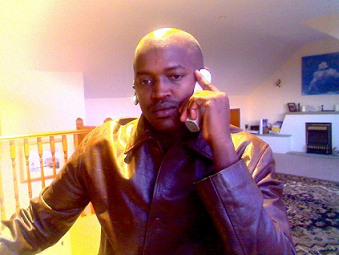 Abantu bagomba kubaza icyo abo basilikari b’abanyamerika bakoraga i Burundi depuis le 2 Avril kugera le 10 Avril 94? Ese baba barashoboye kwiyoberanya muri MINUAR bafashijwe na Dallaire? Ese uwarashe indege ni umwe muribo? Bari baje gukora iki muri icyo gihe? Aba bantu ko nta rapport nimwe bagaragaramo? 2. Ku rundi ruhande aba FPR bari batunze iriya missile SA16 kuko bigeze guhanura za helicoptère za ba FAR mu gihe cy’intambara. Kugera aho kuri site barasiye indege ese MINUAR yaba yarabafashije kuhagera no gutambutsa icyo gisasu cyari kibitse muri Parlement ko bizwi ko MINUAR nta muntu wayihagarikaga kuribarrière? 3. Niba ari Ababiligi bayirashe bivuze ko bitwikiriye akazi kabo ka MINUAR nuko bagakorera akazi FPR bakoresheje icyo gisasu cya FPR cyari kibitse ku Kimihurura? 4. Niba ari Abafaransa Paul Baril cyangwa Saint-Quentin barashe indege baba barakoranaga na bamwe muba extremiste hutu? Ese iyo missile SA16 baba barayikuye he? Ese kuki boite noire babonye ku ndege bahisemo kuyihisha ni iki cyatumaga batayitangaza directement niba ntacyo bikekaga ? Izo nizo pistes enye à suivre ku barashe Habyarimana. Piste ya ba FAR yo iragoye kuyemera kuko batagiraga iyo missile, kandi MINUAR yari yarakoze inventaire y’intwaro zose zari zihari iyo missile y’ubwo bwoko yakorewe mu Burusiya ntayo bagiraga. Umuntu warashe indege ni umuntu washoboraga kubona iriya missile SA16 niyo mpamvu piste y’abasilikari ba Habyalimana idashoboka kuko ntayo bagiraga. Ikindi uruhare rwa MINUAR mu kurasa iyi ndege ni runini cyane ku buryo abari muri iyo mission ya MINUAR nibo ba mbere bagomba guhatwa ibibazo kuko bazi byinshi cyane. Kuba nta muntu ubavuga ni uko bakoreraga akazi une puissance iri hejuru. Iyi rapport ya Trévidic navuga ko icyo izanye gusa ari ukumenya aho indege yarasiwe ko ari ku gasozi ka Kanombe kandi ikanatumenyesha ubwoko bwa missile yarashe indege. Naho akazi gasigaye ko ni kenshi mu nzira yo kumenya ukuri. Abari muri propagande zo kuvuga abarashe indege bo nibabe bitonze ntakaraba. COMMUNIQUE CONJOINT DE PDP- IMANZI ET PS – IMBERAKURI AU SUJET DU RAPPORT BALISTIQUE DES EXPERTS MANDATES PAR LES JUGES MARC TREVIDIC ET NATHALIE POUX SUR L’ATTENTAT DE L’AVION DU PRESIDENT RWANDAIS HABYALIMANA JUVENAL. 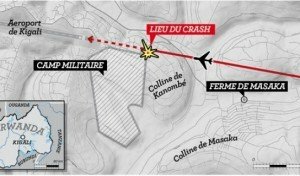 En date du 10 Janvier 2012, les juges français Marc Trévidic et Nathalie Poux ont rendu public le rapport balistique des experts sur l’attentat de l’avion du président Rwandais Juvénal Habyalimana, attentat qui a couté la vie à tous les occupants de l’appareil au moment de l’attentat. Il s’agit des Présidents Juvénal Habyarimana du Rwanda, Cyprien Ntaryamira du Burundi, ainsi que Messieurs Déogratias Nsabimana, Elie Sagatwa, Thaddée Bagaragaza, Emmanuel Akingeneye, Bernard Cyiza, Cyriaque Simbizi, Jacky Hérault, Jean-Pierre Minaberry, et Jean-Michel. Le rapport indique que les missiles ayant abattu l’avion auraient été tirés à partir de six (6) différents points mais ne précise ni le lieu fixe, ni le tireur ou commanditaire de l’attentat. Le PDP-IMANZI et le PS-IMBERAKURI trouve que les éléments fournis par le rapport constituent des éléments parmi tant d’autres tels que les déclarations des témoins et autres dont les juges pourront se servir lors du procès. D’ailleurs, en présentant ce rapport, le juge a précisé qu’il attendait des observations des parties concernées dans un délai de trois (3) mois. Nous nous étonnons dès lors des déclarations victorieuses de certaines parties concernées, car, à notre sens, elles n’auraient d’autres visées que de tenter d’influencer la justice en essayant d’occulter l’existence des autres pistes. Considérant les conséquences désastreuses qu’endurent les familles proches, le peuple rwandais, mais aussi toute la région des grands lacs d’Afrique, nous exhortons toute âme de bonne volonté, en l’occurrence les responsables des deux camps d’alors en conflit ayant l’une ou l’autre information pouvant faire la lumière sur cet attentant de la communiquer aux juges sans tarder. Nous félicitons la justice française d’avoir, sur demande des plaignants, accepté de mener l’enquête et faire un procès sur cet attentat, au moment où la communauté internationale par le biais du TPIR a refusé de se pencher sur ce dossier pourtant entrant dans son mandant. Nous encourageons la justice française à poursuivre ses enquêtes et mener un procès juste car, en plus des plaignants, le peuple Rwandais attend toute la lumière et savoir la vérité sur cet attentat qui, à ses yeux, constitue le début de la tragédie rwandaise d’avril 1994. C’est un défi et une grande responsabilité devant le peuple rwandais tant meurtri et la communauté internationale. Le PDP-IMANZI et le PS-IMBERAKURI demandent au peuple Rwandais et aux parties en cause dans ce dossier, de garder la sérénité nécessaire en attendant les conclusions du procès proprement dit au lieu de se lancer dans des spéculations qui ne visent rien d’autre que de berner l’opinion et semer la confusion dans l’esprit de ceux qui attendent la vérité. Le PDP-IMANZI et le PS-IMBERAKURI saisissent cette occasion pour dénoncer, une fois de plus, l’amalgame faite entre un individu et son ethnie ou sa région. Propager, dans les médias, que l’attentant aurait été commis par un groupe ethnique quel qu’il soit, est une façon de mettre de l’huile sur le feu et semer la haine entre les Rwandais au moment où nous devons œuvrer pour la paix, la réconciliation nationale et l’unité du peuple rwandais. Le PDP-IMANZI et le PS-IMBERAKURI tiennent à rappeler qu’un individu est pénalement responsable de ses actes car il agit par sa propre conscience et non celle de son groupe ethnique. Aucune personne, aussi haut placée soit-elle ne représente l’ethnie HUTU, TWA ou TUTSI, pas plus qu’il ne représente sa famille ou sa région de provenance. Le Peuple Rwandais vient, une fois de plus, de se rendre compte que seuls les Rwandais pourront venir à bout de ces énigmes qui entourent le malheur qui a et continue à endeuiller toute la société Rwandaise. Ce rebondissement des faits nous rappelle que c’est à travers un dialogue inclusif, sincère et constructif entre rwandais de tous bord que nous pourrons connaitre la vérité et envisager le futur ensemble. L’impératif d’un dialogue Inter-Rwandais hautement inclusif est incontournable.